DAMAGED: Team Sanya’s race boat, and all associated equipment, will be packed on to a ship in 24 hours. The crew of Team Sanya are preparing for a hectic 24 hours once their severely damaged boat arrives in Tauranga tonight. Team Sanya chief operating officer David Duff said the Volvo Ocean Race crew were ready to prepare the race boat, and all associated equipment, to be shipped to Miami for repair. The Chinese-flagged entry, skippered by Kiwi Mike Sanderson, was leading the fleet 1500 nautical miles into leg five of the race, from Auckland to Itajai, Brazil, when the starboard rudder of their boat snapped and tore a hole in the hull. The damage happened as Sanya was travelling at high speed and immediately sent the boat into a crash gybe, with caused water to pour into the aft compartment. The boat sustained severe rudder and hull damage and was forced to sail back to New Zealand. The team is unable to deploy the reserve race rudder because the bearings have been mangled, and is using the emergency rudder over the stern of the boat to sail to Tauranga. Mr Duff said the next challenge was to disassemble the boat – a three-day job – in 24 hours and pack it, and all the associated equipment, on the container ship Maersk Bratan before it departed Tauranga on Thursday night. "What we will do is support the boat on its keel, we will raise it from the water on to a cradle, take the rigging down and pack the support equipment like sails, into containers. The mast is 32m long so that needs to be loaded on to the ship as one unit," he said. "Then we need to get everything on board the container ship, the boat, the mast and four containers full of equipment as well, so it’s a lot to do in 24 hours." Mr Duff said the team chose Tauranga because a Maersk Line ship was due to leave Tauranga heading to Miami on Thursday. "So far everyone’s been amazing. … Maersk have been a true team partner and helped make this all happen, as well as the support we have received from DHL and Volvo in New Zealand." To meet the shipping schedule, Team Sanya has to average 14 knots to reach Tauranga late tonight. A support vessel will be sent to East Cape to tow the boat back to Tauranga if the wind falls below 12 knots. Bruce Goodchap, from Tauranga Bridge Marina, said if the boat continued to travel at speed, the tug would "chug along beside it". 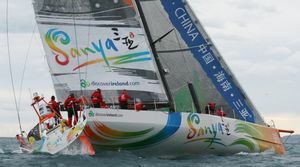 He said initial plans were for Team Sanya to berth in Tauranga Bridge Marina, as it was "extremely difficult" to find an appropriate space at the Port. A return in Miami in May would see the team in a position to contest the final three legs, across the Atlantic to Lisbon, around the Azores to Lorient in France and finally the short sprint to the finish in Galway, Ireland.